I love potatoes in every form, Wee Bear, not so much! However, when it comes to Thanksgiving, mashed potatoes are a must! My family has alway's had basic mashed potatoes for Thanksgiving, but, wait a minute. Enter a puree of potatoes with basil, and Parmesan? 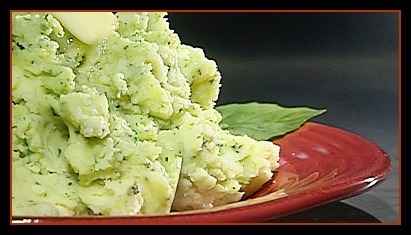 Or, how about Horseradish mashed Potatoes or Perfect mashed Potatoes with Onion Butter? If you're a pesto maniac you won't be able to get enough of its intoxicating anise-like flavor and its impossibly airy texture. Bring a pot of salted water to a boil. Fill a bowl with ice water and set aside. Plunge the basil leaves into the boiling water and leave for 15 seconds. Remove from the boiling water with a slotted spoon and immediately plunge into the ice water – this process is known as blanching. Blanching the basil will preserve its vibrant green color in the potatoes. When the basil leaves are cool remove from the ice water and squeeze out any excess moisture. Peel the potatoes and cut them in quarters. Add the potatoes to the same pot of boiling water and return to a boil. Cook the potatoes for 20 to 25 minutes, until very tender. Drain well, return to the sauce pan, and steam over low heat until any remaining water evaporates. In a small saucepan over medium heat, heat the half-and-half and Parmesan cheese until the cream simmers. Place the basil in a food processor fitted with the steel blade and purée. Add the hot cream mixture and process until smooth. Beat the hot potatoes in the pot until they are broken up or rice them. Slowly add the hot basil cream, the salt, and pepper and beat until smooth. If the potatoes need to be reheated, cover and cook gently over low heat for a few minutes. Pour into a serving bowl, sprinkle with extra Parmesan cheese, season to taste, and serve hot.